Z-Wars is average tower defense from Z-Fox. It has no maps and you can use maze strategy for this game. Wall is not the weapon. It can only help you to direct enemies in a maze. Machine Gun is basic weapon with good rate but low damage. Zap Tower is weapon with low range and low rate. It has average damage. Saw is weapon with low range and damage, but with excellent rate. I used this weapon in the corners of a maze. Bomb Tower fires bomb that explodes in short time after throwing with good damage. It has good range but lower rate. Rocket Launcher is very good weapon with excellent range and rate. Poison Gas Tower attacks enemies with poison. It has low damage for long time, and it is good to place this weapon at start of a maze. Laser Tower is good weapon with excellent rate, range and good damage. Charge Coil is good weapon against strong enemies. Its damage increases during time, while it is charging. Air Raid is an emergency weapon and can kill up to 5 enemies at once. But you don't earn money nor points from such killed enemies. You can upgrade standard weapons many times. It is important to do it during the game. You can also sell towers. Specialty of this game is possibility to move weapons. It is not cheap, but sometimes it can be very useful. Z-Wars has a little bit complicated game engine. Controls are situated in windows. You can move them or close them. It took me some time to be friendly with it. The game has annoying background music, but it is possible to stop it. I am missing info about wave number. 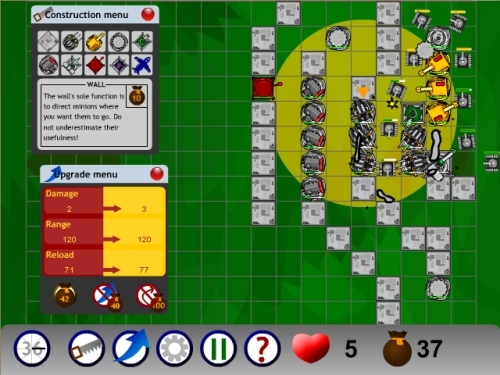 To be successful in this game, you need to use maze strategy. The game has very good designed difficulties of each wave. It is not easy game, and you will spend some time to win in this game. Z-Wars is an average tower defense game with very good playability and a little bit complicated game engine. I am giving this game 7.0 points from 10.